For take thy balance if thou be so wise And weigh the wind that under heaven doth blow; Or weigh the light that in the east doth rise; Or weigh the thought that from man's mind doth flow. I Thy God am the Light and the Mind which were before substance was divided from Spirit and darkness from Light. If we do not find anything pleasant, at least we shall find something new. It is new fancy rather than taste which produces so many new fashions. Prejudice, friend, governs the vulgar crowd. Slavery is also as ancient as war, and was as human nature. To believe in God is impossible, not to believe in Him is absurd. 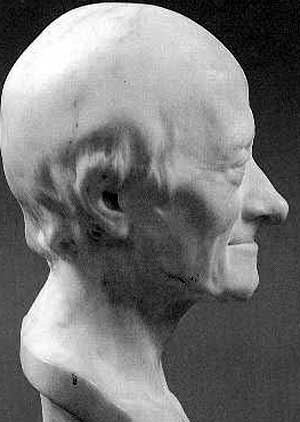 Bust of Voltaire by the artist Antoine Houdon, 1781.François-Marie Arouet de Voltaire was born in Paris in 1694, the last of the five children of François Arouet (1650–1 January 1722) a notary who was a minor treasury official, and his wife, Marie Marguerite d'Aumart (c.1660–13 July 1701) from a noble family from the Poitou province. Voltaire was educated by Jesuits at the Collège Louis-le-Grand (1704-11), where he learned Latin and Greek; later in life he became fluent in Italian, Spanish and English. From 1711 to 1713 he studied law. Before devoting himself entirely to writing, Voltaire worked as a secretary to the French ambassador in Holland, where he fell in love with a French refugee, named Catherine Olympe Dunoyer. Their elopement was foiled by Voltaire's father, and he was forced to return to France. 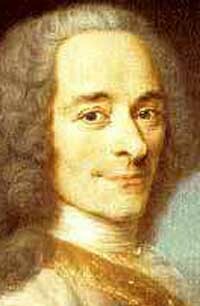 Most of Voltaire's early life revolved around Paris until his exile. From the beginning Voltaire had trouble with the authorities for his energetic attacks on the government and the Catholic Church. These activities were to result in numerous imprisonments and exiles. In his early twenties he spent eleven months in the Bastille for writing satirical verses about the aristocracy. After graduating, Voltaire set out on a career in literature. His father, however, intended his son to be educated in the law. Voltaire, pretending to work in Paris as an assistant to a lawyer, spent much of his time writing satirical poetry. When his father found him out, he again sent Voltaire to study law, this time in the provinces. Nevertheless, he continued to write, producing essays and historical studies not always noted for their accuracy. Voltaire's wit made him popular among some of the aristocratic families. One of his writings, about Louis XV's regent, Philippe II, Duke of Orléans, led to his being imprisoned in the Bastille. While there, he wrote his debut play, Œdipe, and adopted the name Voltaire which came from his hometown in southern France . Œdipe's success began Voltaire's influence and brought him into the French Enlightenment. at 70 years old, an engraving from an 1843 edition of his Philosophical DictionaryVoltaire then set out to the Château de Cirey, located on the borders of Champagne, France and Lorraine. The building was renovated with his money, and here he began a relationship with the Marquise du Châtelet, Gabrielle Émilie le Tonnelier de Breteuil. The Chateau de Cirey was owned by the Marquise's husband, Marquis Florent-Claude du Chatelet, who sometimes visited his wife and her lover at the chateau. Their relationship, which lasted for fifteen years, led to much intellectual development. Voltaire and the Marquise collected over 21,000 books, an enormous number for their time. Together, Voltaire and the Marquise also studied these books and performed experiments. Both worked on experimenting with the "natural sciences," the term used in that epoch for physics, in his laboratory. 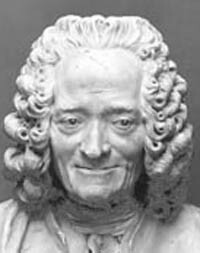 Voltaire performed many experiments including one that attempted to determine the properties of fire. Die Tafelrunde by Adolph von Menzel. Guests of Frederick the Great, in Marble Hall at Sanssouci, include members of the Prussian Academy of Sciences and Voltaire (seated, third from left).After the death of the Marquise, Voltaire moved to Berlin to join Frederick the Great, a close friend and admirer of his. The king had repeatedly invited him to his palace, and now gave him a salary of 20,000 francs a year. Though life went well at first, he began to encounter difficulties. Faced with a lawsuit and an argument with the president of the Berlin Academy of Science, Voltaire wrote the Diatribe du Docteur Akakia (Diatribe of Doctor Akakia) which derided the president. 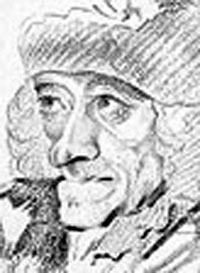 This greatly angered Frederick, who had all copies of the document burned and arrested Voltaire at an inn where he was staying along his journey home. Voltaire headed toward Paris, but Louis XV banned him from the city, so instead he turned to Geneva, where he bought a large estate. Though he was received openly at first, the law in Geneva which banned theatrical performances and the publication of La pucelle d'Orléans against his will led to Voltaire's writing of Candide, ou l'Optimisme (Candide, or Optimism) in 1759 and his eventual departure. Candide, a satire on the philosophy of Leibniz, remains the work for which Voltaire is perhaps best known. Views on Christianityopposed Christian beliefs fiercely. He argued that the Gospels were fabricated and Jesus did not exist - that they were produced by those who wanted to create God in their own image and were full of discrepancies. On the other hand, he quoted the Scripture extensively and expertly in such works as Traité sur la Tolérance to argue in favor of tolerance for "fanatic" religious minorities, in that case the Protestants. Neither did he hide his sympathy for the Jansenists. Views on raceexpressed his views on race, mostly in his work Essai sur les mœurs, holding that black people, whom he called "animals", were a peculiar species of human because of what he perceived as great differences from other humans, both physically and mentally. Voltaire expressed much the same views in his personal correspondence. In Traité de Métaphysique, his philosophical narrator claimed that white men "seem to be superior to Negroes, just as Negroes are superior to monkeys and monkeys to oysters." Voltaire's stance on blacks may be related to his financial interests. The philosopher made an investment in a slave-trading enterprise in Nantes, which, according to the contemporaneous observers, made him one of the twenty richest men in France. However, some passages of Candide reveal hostility to the violent treatment of slaves, although in Essai sur les moeurs he states that Negroes are born to be slaves. Views on Jews's viewpoint on Jews, Judaism and all organized religion reveals antisemitism on his part. He once wrote, "The Jewish nation dares to display an irreconcilable hatred toward all nations, and revolts against all masters; always superstitious, always greedy for the well-being enjoyed by others, always barbarous — cringing in misfortune and insolent in prosperity." Philosophy's largest philosophical work is the Dictionnaire philosophique, comprising articles contributed by him to the Encyclopédie and of several minor pieces. It directed criticism against French political institutions, Voltaire's personal enemies, the Bible and the Roman Catholic Church, showing the character, literary and personal, of Voltaire. Views on New Francewas a critic of France's colonial policy in North America, dismissing the vast territory of New France as "a few acres of snow" ("quelques arpents de neige") that produced little more than furs and required constant - and expensive - military protection from the mother country against Great Britain's 13 Colonies to the south. Correspondencealso engaged in an enormous amount of private correspondence during his life, totalling over 21,000 letters. His personality shows through in the letters that he wrote: his energy and versatility, his unhesitating flattery when he chose to flatter, his ruthless sarcasm, his unscrupulous business faculty and his resolve to double and twist in any fashion so as to escape his enemies. 's statue and tomb in the crypt of the Panthéon.Voltaire perceived the French bourgeoisie to be too small and ineffective, the aristocracy to be parasitic and corrupt, the commoners as ignorant and superstitious, and the church as a static force useful only as a counterbalance since its "religious tax" or the tithe helped to create a strong backing for revolutionaries. Voltaire distrusted democracy, which he saw as propagating the idiocy of the masses. To Voltaire, only an enlightened monarch or an enlightened absolutist, advised by philosophers like himself, could bring about change as it was in the king's rational interest to improve the power and wealth of his subjects and kingdom. Voltaire essentially believed monarchy to be the key to progress and change. The town of Ferney, France, where Voltaire lived out the last 20 years of his life (though he died in Paris), is now named Ferney-Voltaire. His château is now a museum (L'Auberge de l'Europe). Voltaire's library is preserved intact in the Russian National Library, St Petersburg. 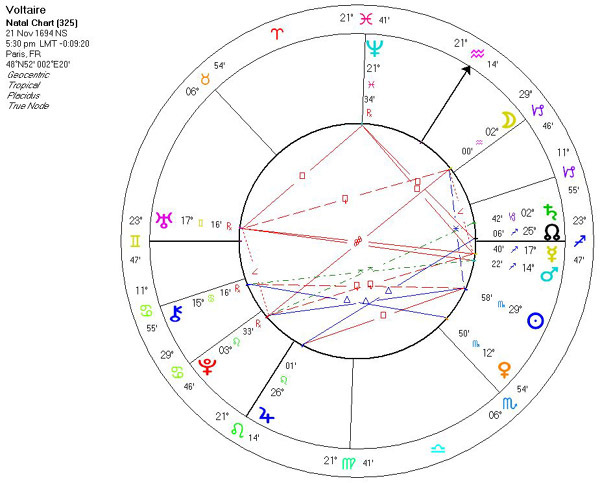 His remains were interred at the Panthéon, in Paris, in 1791. The name "Voltaire," which he adopted in 1718 not only as a pen name but also in daily use, is an anagram of the Latinized spelling of his surname "Arovet" and the letters of the sobriquet "le jeune" ("the younger"): AROVET Le Ieune. The name also echoes in reversed order the syllables of a familial château in the Poitou region: "Airvault". The adoption of this name after his incarceration at the Bastille is seen by many to mark a formal separation on the part of Voltaire from his family and his past. 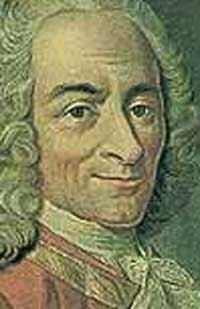 François Marie Arouet (who later assumed the name Voltaire) was born in Paris on November 21st 1694. The family was wealthy, his father was a notary and his mother maintained contacts with friends interested in belles-lettres and Deism. From 1704 - 1711 François Marie was educated by the Jesuits at the College Louis-le-Grand, his later involvement with the writing and staging of plays may have been encouraged by the numerous plays, in Latin as well as French, that were staged at College Louis-le-Grand. Despite his father's wishes that he train for a career in Law François Marie, after a short period of work in a legal office, chose to attempt to pursue a literary career. He soon began to fall in with questionable company and to cause offense through the power and sarcasm of his wit and poetry. Because of these tendencies his father, on several occasions, arranged for him to spend time away from Paris. From about 1715 François Marie increasingly began moving in aristocratic circles including a famous salon-court that was maintained by the Duchesse du Maine at Sceaux. He became recognised in Paris as a brilliant and sarcastic wit - a lampoon of the French regent the Duc d'Orléans and also his being accused, (unjustly), of penning two distinctly libelous poems resulted in his imprisonment in the Bastille. This imprisonment being imposed following the composition of a lettre de cachet, an administrative order, issued at the request of powerful persons. François Marie was most aggrieved at this unjust sentence to imprisonment being imposed on him. It was during his subsequent eleven month period of detention that François Marie Arouet / Voltaire completed his first dramatic tragedy, Oedipe. This dramatic work was based upon the play Oedipus Tyrannus attributable to the ancient Greek dramatist Sophocles. (It was during these times that François Marie adopted the pen name Voltaire). Voltaire's Oedipe opened at the Théâtre Français in 1718 and received an enthusiastic response. During his period of detention in the Bastille he had also begun to craft a poem centered on the life of Henry IV of France. An early edition of this work, which features an eloquent appeal for religious toleration, was printed anonymously in Geneva under the title of Poème de la ligue (Poem of the League, 1723). King Henry IV had been an Huguenot (protestant) claimant to the French throne but was only accepted as King after modifying his approach to religion. 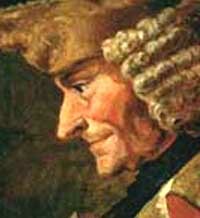 Voltaire was consigned to the Bastille, again by lettre de cachet, after he had given offence to the chevalier de Rohan who was member of one of the most powerful families in France. This time however he was released within two weeks following his promise to actually quit France and to begin a period of exile. Accordingly he spent almost three years in London where he soon mastered the English language and wrote, in English, two remarkable works, an "Essay upon Epic Poetry" and an "Essay upon the Civil Wars in France". Whilst in England he regularly attended the theatres and playhouses and saw several performances of Shakespeare's plays. "We can well believe that a constitution that has established the rights of the Crown, the aristocracy and the people, in which each section finds its own safety, will last as long as human institutions can last". The scientific discoveries of Sir Isaac Newton also attracted his serious attention. For the rest of his long literary and philosophical career he did a very great deal to popularise the ideas of Locke and to spread knowledge of the discoveries of Newton. It can be suggested that Locke's and Newton's ideas tended to encourage people to have faith in their own physical senses and in their powers of reason to the detriment, more often than not, of religious faith. In 1728 the autocratic French government finally allowed the Poème de la ligue, (which was now retitled La Henriade) to be published in France. This work achieved a most remarkable acclaim, not only in France but throughout all of the continent of Europe as well. Voltaire returned to France in 1728 and was to reside in Paris over the subsequent four years devoting his time to literary activities. The chief work of this period is the Lettres anglaises ou philosophiques (English or Philosophical Letters, 1734). This work favourably commented upon the relative ease with which educated commoners in England might take up occupations and professions, it also strongly suggested that there was a degree of press freedom, of equality of taxation, and of respect shown to the individual, and to the law, in England that should be emulated elsewhere. His Lettres anglaises ou philosophiques effectively constituted a covert attack upon the political and ecclesiastical institutions of France and thus brought him into conflict with the authorities. Voltaire was once more forced to quit Paris and found refuge from the French authorities at the Château de Cirey in Lorraine, then an independent Duchy. There he formed an intimate relationship with the learned Marquise du Châtelet, who exerted a strong intellectual influence upon him. In 1735 he was given leave to return to Paris by the French authorities but, in the event, he preferred to continue as he was at Cirey. He did however make visits to Paris, Versailles, and elsewhere. Several years thereafter and largely through the influence of the Marquise de Pompadour, the famous mistress of Louis XV, Voltaire became a court favorite. He was appointed Royal Historiographer of France, and then a gentleman of the King's bedchamber. In 1746 he was elected to the French Academy. Following the death of Madame du Châtelet in 1749, he finally accepted a long-standing invitation from Frederick II of Prussia to become resident at the Prussian court. He journeyed to Berlin in 1750 but did not remain there more than two years due to a series of misunderstandings and scandals. There was at this time something of a fashion for European rulers to style themselves as being enlightened despots. Apart from Frederick II, King of Prussia, Catherine the Empress of the Russias is perhaps the most notable example of this. The Empress used also, in fact, to correspond with him. Following his departure from Berlin he was not welcome to return to France and began a series of temporary stays in towns, such as Colmar and Geneva, along her frontiers. During these years he completed his most ambitious work, the Essay on General History and on the Customs and the Character of Nations, 1756. This work sets itself out to be a study of human progress, through its pages he denounced the power of the clergy but made evident his own rationalist-deist belief in the existence of God. From 1758 he established a more enduring home at Ferney, nearby to Geneva but within the frontiers of the French kingdom, where he spent the remaining 20 years of his life. Many European celebrities subsequently included a visit to Ferney in their itineraries - a fact which tended to establish Ferney as the virtual intellectual capital of Europe. 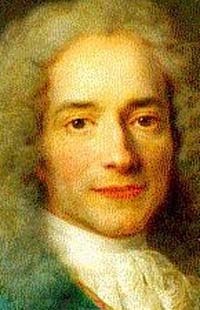 Voltaire is considered to have been a central figure in the emergence of the Enlightenment movement in Europe where people were increasingly encouraged to practice toleration in religion and to look to the practical application of natural laws discovered by science for the material improvement of human life. He also tended to effectively persuade people that superstition was ridiculous. After settling in Ferney, he wrote several philosophical poems, such as Le désastre de Lisbonne (The Lisbon Disaster, 1756), and a number of satirical and philosophical novels, of which the most brilliant is Candide (1759). The publication of the Dictionnaire philosophique (1764) met with condemnation in Paris and other European cities. It was considered to encourage people to look to reason rather than to faith. A copy of the Dictionnaire philosophique was actually burned at the same time as the unfortunate young Chevalier de la Barre, who had neglected to take of his hat, and kneel, during the passing of a religious procession. Given the furore over the Dictionnaire he thought it prudent to deny authorship and to seek exile for a few weeks in Switzerland. Voltaire contributed to what proved to be perhaps the greatest intellectual project of the times, the great ongoing Encyclopedié edited by the Philosophés Denis Diderot and Jean d'Alembert. The Encyclopedié was also to become the subject of controversy as it too was considered to challenge faith by encouraging people to look to the power of reason. Voltaire considered that his own earlier life experiences of imprisonment and exile for exercising his wit at the expense of the powerful were effectively a result of the abuse of power. Individuals should not have to live under the threat of such abuse by the powerful in society. From Ferney his mind and pen sent forth hundreds of literary utterances in defence of freedom of thought and of religious tolerance. He was also very apt to satirise and to expose what he considered to be abuses. Those who seemed to have suffered persecution because of their beliefs found in him an eloquent and influential defender. His championship of freedom of thought and of religious tolerance in several notable cases brought him into a direct conflict with the Catholic church authorities. He saw the Catholic church authorities in France as often behaving in a repressive manner and particularly so towards Huguenots. He often used the phrase écrasons l'infâme let us crush the infamous one by which he seems to have meant intellectual, religious, and social intolerance generally. In 1778 Voltaire was given a rapturous welcome on his return to Paris and died there, in his sleep on May 30th, possibly over-excited by his recent journey and welcome. Because of his many unorthodoxies he was refused burial in church ground but eventually found a resting place in the grounds of the Abbey of Sellières, near Romilly-sur-Seine. From 1789 there was a revolution in France which, amongst many other things, unmistakeably upheld "reason" and "virtue". In relation to Voltaire some of the leading revolutionaries considered that the "glorious Revolution has been the fruit of his works". In July 1791 his remains were dis-interred and, amidst great ceremony, re-housed in an imposing Sarcophagus in the Panthéon in Paris. The Panthéon being a recently completed building that had been begun as a church of St. Genevieve but which had been finished, by the revolutionary government, as a monument to those designated by the revolutionaries as "les Grands Hommes." As Voltaire's remains were borne toward the Panthéon, in a hearse designed by the painter David that bore the inscription "He taught us to be free", they were escorted by the National Guard. Perhaps an hundred thousand people followed in the cortege with many more thousands looking on. At this time Voltaire shared the Panthéon with René Descartes, regarded by the intellectual heirs of the Enlightenment as the patron saint of Reason, and also the revolutionary leader Mirabeau. In 1814, with the French revolutionary and Napoleonic era being ended by a restoration of the Bourbon monarchy a group of persons who tended to hold right-wing, clericalist, political views clandestinely removed his remains from the Panthéon - although their absence was not discovered until 1864. Voltaire's heart and brain, however, had been removed even before the burial in Champagne - his brain is today preserved in the Bibliotheque Nationale in Paris - his heart was in the care of a series of private custodianships for more than one hundred years but eventually disappeared after an auction.